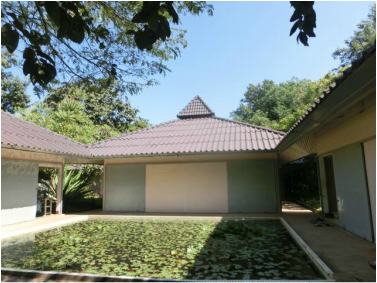 The Houey Hong Vocational Training Centre for Women is located in Houey Hong village (Ban Hoeuy Hong) surrounded by two hectares of lush garden. It is 7km from the centre of town towards the National University. The Centre itself is made up of eight compounds including an office and shop, conference room, two tailoring rooms, two weaving rooms, a dyeing and stock area, a dormitory and cooking facilities. The founder of the Centre is Ms. Chanthasone Inthavong, a Vientiane native, now living and working in Tokyo, Japan. In 1982 she set up Action with Lao Children (ALC), a literacy non-governmental organisation, now with offices in both Japan and Laos. Whilst working she still actively supports Houey Hong Centre and ALC in Japan, with many exchanges between the two countries. Sengmany Vongsipasom, Chanthasone's sister, who returned to Vientiane after 20 years living in the USA, manages the day-to-day operations. The artisans and trainers of the centre are natural dye experts, weavers, tailors and designers. Chanthasone founded the Centre in 1998, with support from two Japanese organisations Association for Supporting Women and Lao Children (ASCW) and the Association for Providing Jobs for Lao Women (APJW). This support assisted in the construction of the Centre’s first three buildings. Between 1999 and 2001, the Japanese Government organisation, Japan International Cooperation Agency (JICA), provided grants to build another four buildings, and assisted in developing the first training modules and funding the Centre’s first nine training groups.